An American brewery has apologised for putting a picture of Indian independence hero Mahatma Gandhi on its beer cans, reports say. New England Brewing Company's move came after a petition was filed in an Indian court saying that the move had "insulted" the leader. Gandhi led non-violent resistance to British rule in India. He was assassinated in January 1948, months after India secured independence. 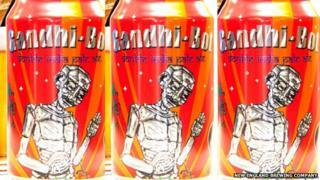 The brand carrying the image of the leader is called Gandhi-Bot, which is an India Pale Ale. The company says on its website that the beer is an "ideal aid for self-purification and the seeking of truth and love". A lawyer filed a petition in a court in the southern Indian city of Hyderabad, alleging that carrying Gandhi's image on alcohol cans was "condemnable" and punishable under Indian laws. The company said it apologised if any sentiments had been hurt. There was no indication the company would withdraw the beer. "We do apologise if the good people of India find our Gandhi-Bot label offensive. Our intent is not to offend anyone but rather pay homage and celebrate a great man who we respect greatly," Matt Westfall, head brewer and partner at the Connecticut-based company said in an email to the Press Trust of India news agency. He said he hoped the product inspired people "to learn more about Mahatma Gandhi and his non-violent methods of civil disobedience. So many Indian people here in American love our tribute to the great man." Mr Westfall said Gandhi's "granddaughter and grandson have seen the label and have expressed their admiration". It was unclear to which relatives the firm was referring. "We hope that you understand our true intent and respect the method and the freedom we have to show our reverence for Gandhi."